The still at Ghost Coast Distillery. Photo Courtesy Ghost Coast. Plenty of towns have a local distillery blending its own whiskey, but not all of them make their own version of Chartreuse, an herbal liqueur produced in France from 130 different herbs and botanicals. Then, you have Ghost Coast Distillery, which happens to be doing both. As Savannah, Georgia’s first, and only, distillery since Prohibition, Ghost Coast, which is relatively new to the scene, is making strong waves in the port city. Opened almost two years ago, the distillery currently houses its first bourbon, set to release in 2020. It uses five grains, three distinct mash bills, and two types of yeast to make six different pot-distilled bourbons. But while the corn-based spirit ages, the Ghost Coast team has set about to make rye whiskies using local ingredients like ginger, as well as other less time-intensive spirits including vodka, flavored vodka, and rum. The journey has been a bit unconventional; it all started with their desire to make cocktails and need for an ingredient like Chartreuse. However, they couldn’t actually use the French ingredient. After opening a few months earlier, a change in the Georgia law in mid-2017 allowed independent distilleries to serve more than a one-ounce taster on-site. An ounce taster barely moved in the needle in terms of sales. A cocktail, however, would showcase the range a particular spirit had in terms of mixology and give the consumer time to fall in love with the product as they sipped the beverage. For Ghost Coast, that inspired their creation of a full cocktail menu in a trendy and inviting bar next to the distillery. The snag according to the law? Everything must be produced on the property. That didn’t deter Sywassink, his co-founder Rob Ingersoll, and the rest of the Ghost Coast team, who simply decided they’d make anything they required for a drink recipe in-house. Need an agave spirit for a Cinco de Mayo party? They made it. Want a tiki-style rum for fruity cocktails? Done. Showcasing local huckleberries in a cocktail? Craft a shrub. They launched a research and development lab that begins with what cocktail they want to make, and they work backward to produce the necessary ingredients. It now produces 21 different spirits. To showcase their Jenny gin, for example, the team put a twist on the classic cocktail, the Last Word. That meant they needed a green Chartreuse. 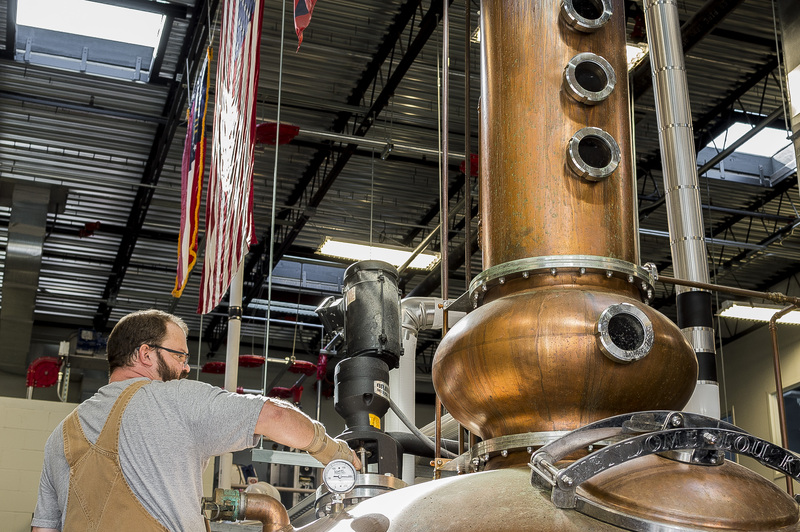 it is not an ingredient typically made by a distillery in their first years of business. 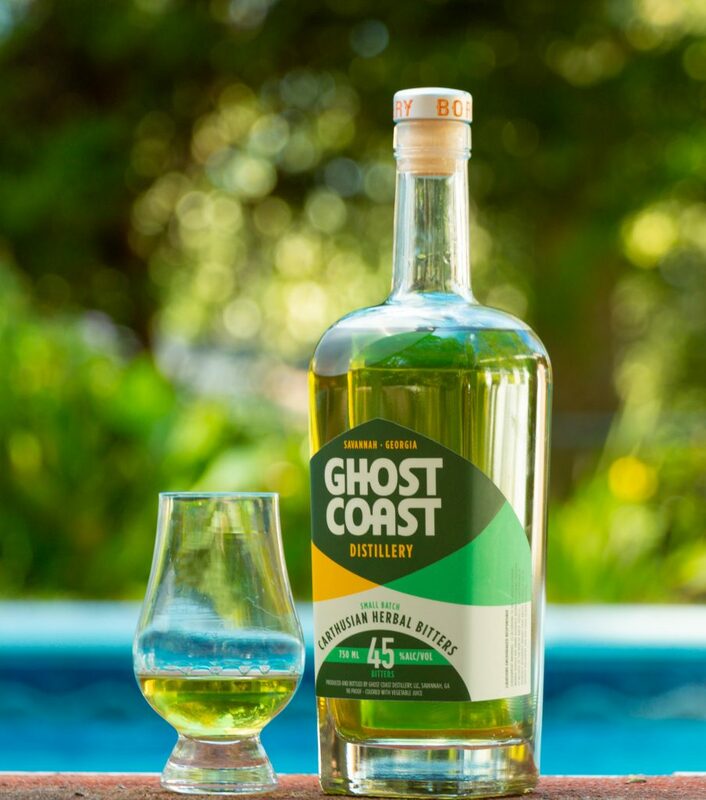 The traditional green Chartreuse, the style that Ghost Coast makes, hails from France, where Carthusian monks have produced the amaro in monasteries since 1737. The exact recipe is not publicly known. In fact, it’s highly guarded. According to the reports about the origins of the drink, it is said to have a blend of 130 different plants, flowers and herbs. It’s also one of the few liqueurs known to get better with age. To create their own, Sywassink says, they looked a series of 19th-century texts and distilling books. Carth Bitters from Ghost Coast Distillery. The distillery labels it Carthusian Bitters rather than Chartreuse as a demarcation of its origins in the U.S. (To be labeled Chartreuse specifically, it must be made by Chartreuse monks at one of their seven distilleries in France). As for the resulting cocktail, the team combined their gin with their Carthusian bitters, a cherry-almond liqueur to take the place of the traditional Maraschino, and lime juice. “If the customer understands Green Chartreuse, they tend to love it.” Sywassink says. “We’ve generally had a very positive reaction to it.” To reinforce that, he noted the recent SIP international spirits award win by the product. The Carthusian Bitters just launched statewide in Georgia, and the team hopes it finds its way onto bars. Meanwhile, they’ll start launching limited edition, single-cask bottlings of their bourbon as well as expand the distribution of their rye whiskeys and tiki rum across state lines. When they set about to launch a distillery, Sywassink says they wanted to create an unique product that honored Savannah’s history with alcohol—it’s a shockingly close one. For 18th-century sailors, the city was a watering hole. The local Yamacraw Indians’ chief Tomochichi promoted trade with the colonists, including alcohol, before America was, well, America. The city and its county, Chatham, tried to secede from the state of Georgia when it first banned alcohol in 1908, a decade prior to Prohibition. During Prohibition, the townspeople continued to drink in speakeasies, which gives it as much claim to the revived trend as New York City. Today, that love affair with cocktails continues with the city’s open-container laws, explosion of craft cocktail bars, including the well-known Artillery, and the infamous St. Patrick’s Day celebration that draws in 300,000 revelers. It was no surprise the team would want to produce bourbon as well as tackle something like a Chartreuse.